Who’s ready to get their ’90s nostalgia going? 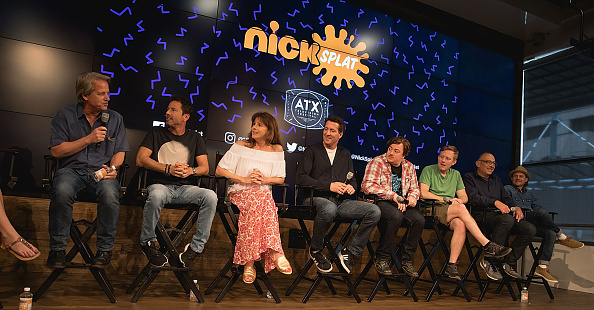 At the ATX TV Festival actors from popular ’90s Nickelodeon TV shows came together to talk about their shows. The “From SNICK to Splat: Where Kids are King” panel was asked about where they think their characters are now. The creators also talked about what they thought was going on in their show’s universe. This amazing panel featured actors and creators from The Adventures of Pete & Pete (Michael C. Maronna, Chris Viscardi, Danny Tamberelli), Salute Your Shorts (Danny Cooksey, Steve Slavkin), and Hey Dude (Kelly Brown, David Lascher, Graham Yost). Check out the cast and creators from The Adventures of Pete & Pete, Hey Dude and Salute Your Shorts on stage at ATX Television Festival! Our favorite Nickelodeon characters are doing some interesting things! Bobby Budnick from Salute Your Shorts is probably a camp counselor, according to Danney Cooksey. There are no surprises about the Petes from Pete and Pete. Especially for Big Pete. Little Pete, according to Tamberelli probably has more tattoos and has gotten into music. Meanwhile, Bradley ‘Brad’ Taylor of Hey Dude would have become the owner. When it comes to Hey Dude, Brown thinks that Brad would own the Bar None Dude Ranch. Lascher, who played Ted McGriff on the show, thinks that he’d be working for Brad on the ranch. The shows’ creators had positive outlooks about what would be going on in their respective show’s worlds. Slavkin on Salute Your Shorts thinks that there are kids at Camp Anawanna today, and the camp is still running strong. Viscardi thinks that in The Adventures of Pete & Pete universe the Petes are still forced to go on their annual Hoover Dam trip. And Hey Dude creator Yost believes that people still love going to the dude ranch. We couldn’t agree more. And now we’re in the mood to binge on our favorite ’90s classics.